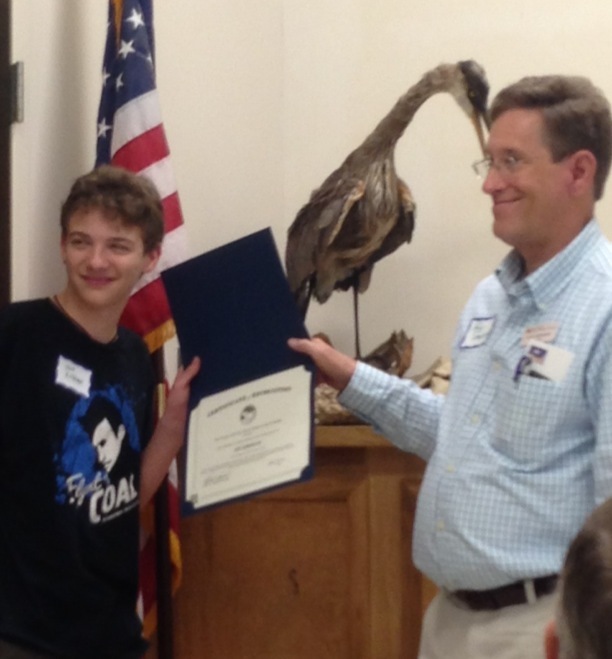 I went to a board meeting of the Friends of the Fort Worth Nature Center & Refuge yesterday (7/13/13). It was also my Grandpa’s birthday, as well as Patrick Stewart (Captain Picard), Harrison Ford, Cheech Marin and that crazy Ken Jeong. Plus, Julius Cesar who lived around 100 BC. Anyway — back to the Friends. I got a nice award for my fundraising efforts. The picture is me accepting my award from President Rick Shepherd. President Elect, Marty Leonard introduced some of the Friends new board members. According to Laura Harrison (treasurer) the Friends of the FWNC&R is doing OK from a financial standpoint. They have received grants and all. Dale Roberts helped a lot, too. BTW, Dale contributed lots of stuff to the JoeBites auction. Suzanne Tuttle, the big boss of the Nature Center gave us all a report of what is happening at the Nature Center. There’s going to be a lot of great stuff happening out there, so it would neat for you to go check it out over the next year. There was a speaker, Dr. Rick Ashley, who spoke about tracking of the bobcat in rural areas. It was VERY interesting. Thanks, Dr. Rick. Maybe I can interview you for my blog sometime? It was a good day. Probably even nice today because the weather in Fort Worth is rainy and cool. We never get rain nor cool in the summers, here in Fort Worth! It’s a welcome relief.